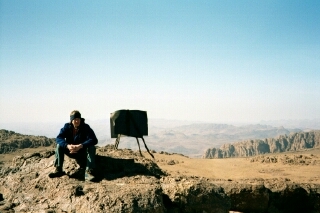 On the summit of Jebel Aklim (2531M). Anti Atlas, Morocco. January 2002. I entered the profession at the later than usual age of 32 following qualification from Liverpool in 1996. Prior to this I left school in 1980 without any qualifications where upon I worked on a mixed dairy, beef and arable farm in Worcestershire until 1985. I was mainly involved with the rearing of calves, and over time became interested in the diseases which they succumbed to. Although I was not aware of it at the time, it was that interest which later encouraged me to pursue a career in veterinary science. I obtained my heavy goods vehicle licence and spent the following 3 years driving lorries for a living. In 1988 I decided it was time to return to college full time to acquire GCSE's and then 'A' levels, with the hope of admission to university to read veterinary science, whilst Milking cows and driving lorries during my weekends and holidays. Hard work, but good fun most of the time. Once qualified I was lucky enough to find a position as a small animal assistant in a practice where I was allowed clinical freedom and to make and learn from my own mistakes. They were a good bunch (Most of them most of the time! ), and I remained there for 5 years until becoming a locum in August 2001. For the foreseeable future I shall remain a locum as it seems a better lifestyle choice; it gives more flexibility than a full time position, a better work-life balance and allows me to pursue other interests and travel. Locum work is a valuable professional experience too; I have witnessed and learnt a great deal from the practices I have worked in. On the summit of Ouanoukrim, Morocco's second highest mountain in the high Atlas (4069M). Mount Toubkal, Morocco's highest mountain (4167M) is in the background. June1999. Nationality: British, born and bred in rural Worcestershire. Marital status: Partnered to Danielle since 1997. Driving Record: Clean driver's licence, including motorcycle and HGV 1. RCVS: Paid up member and in good standing with. Small animal locum; Most of my work involves returning to a handful of small practices on a regular basis, time at both Southside and Vets-Now emergency clinics, and the RSPCA hospital in Birmingham. Numerous positions around the country, including many sole charge. Also 1 month’s volunteer work in Greece neutering cats for the Greek Cat Welfare Society. Veterinary surgeon, Bunbury Veterinary Centre, Northfield, Birmingham. 100% small animal practice. This is a position where I was always allowed to work up my own cases, and was given as much clinical freedom as one would want. I had two weekly operating days, where I dealt with my own surgical cases. My work also involved RSPCA cruelty cases, reporting on them and appearing in court on their behalf as a professional witness. I also took sole charge of the surgery when colleagues were on holiday or ill. My main interests were anesthesia and soft tissue surgery. As a clinical veterinary student, I spent some 26 weeks in general practice, including 4 weeks at the Birmingham RSPCA Hospital to gain surgical experience and a week in a diagnostic pathology laboratory. Graduated on 26 July, 1996 with BVSc with commendation. Obtained credits in veterinary anatomy, physiology and parasitology. Largely responsible for the rearing of calves on a 140 cow dairy and 200 bull beef mixed farm. Winter and expedition Mountaineering: both in the UK and abroad, but in particular winter mountaineering in Scotland. Trips to the Nepalese, Indian and Pakistani Himalaya, Morocco, Czech Republic, Slovakia, the French and Spanish Pyrenees, the French, Swiss and Austrian Alps, Ethiopia, Guatemala, Peru, Bolivia, Tajikistan, Uzbekistan and Macedonia. Cycling. Road cycling including long distance Audax rides through the summer. Good cuisine, real ale and cookery.